Foxx’s long-time fascination with bits of old obscure film, starts to come together in this unusual concept album. Tiny Colour Movies is made up of 15 electronic instrumentals, each representing a fragment of film, and it opens with “Stray Sinatra Neurone” – a vibrant, floating track which instantly draws you in. Although each track is very different, the album does flows well, though perhaps a little too well towards the end, as it becomes hard to distinguish where one track ends and the next begins. Very few of the tracks build up, and there is little rhythm and percussion. The pieces vary in length, with the shortest, “Interlude”, lasting only 42 seconds, whilst the album's longest track, “Kurfurstendamm” lasts over seven minutes. 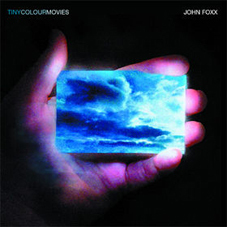 While there are often slight similarities to Foxx's Cathedral Oceans work, Tiny Colour Movies is a very different sort of instrumental album – and like many listeners, I was left yearning to actually watch the mysterious little films which inspired the songs. Tiny Colour Movies takes Foxx’s fascination with the city to another level; We still have the quiet man, and the same themes present in so many Foxx songs, but somehow there is something more to Tiny Colour Movies – a magical quality though the treasures of old movie and musical glimpses into someone else’s life. This dreamy album has to be played with the concept behind it firmly fixed in your mind. Close your eyes and drift away. Some of the very best tracks are “Kurfurstendamm”, “Stray Sinatra Neurone”, the haunting “Skyscraper”, the mysterious “A Peripheral Character” and the closing track, “Hand-held Skies”. Tiny Colour Movies is a fascinating and unusual collection of songs, yet so distinctly John Foxx, despite being like no other album in his back catalogue. The album's running time of 47 minutes passes by in a flash as you get drawn deeper into the music and ultimately absorbed. Having performed the music live to projections of the films in question, there is no doubt that Tiny Colour Movies is an ongoing obsession for John Foxx, as he continues to compose music for found and created film.